Narrator: I used to hate having to deal with pious know-it-alls. Man 1: How do you do! Man 1 now has a halo over his head. 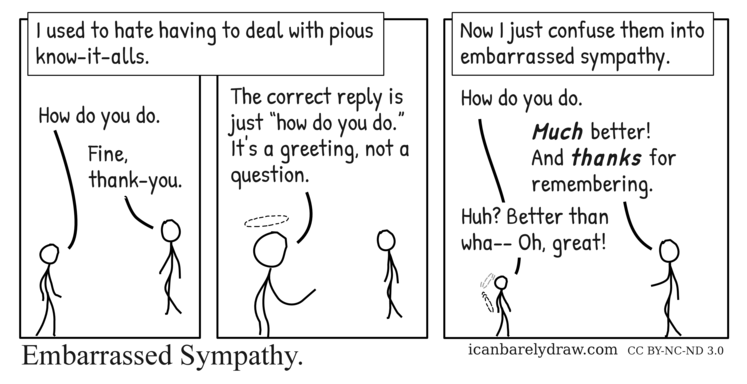 Man 1: The correct reply is just “how do you do.” It's a greeting, not a question. Narrator: Now I just confuse them into embarrassed sympathy. Man 1: How do you do. Man 2: Much better! And thanks for remembering. Man 1: Huh? Better than wha-- Oh, great! The halo above Man 1's head is seen to be falling down behind him.